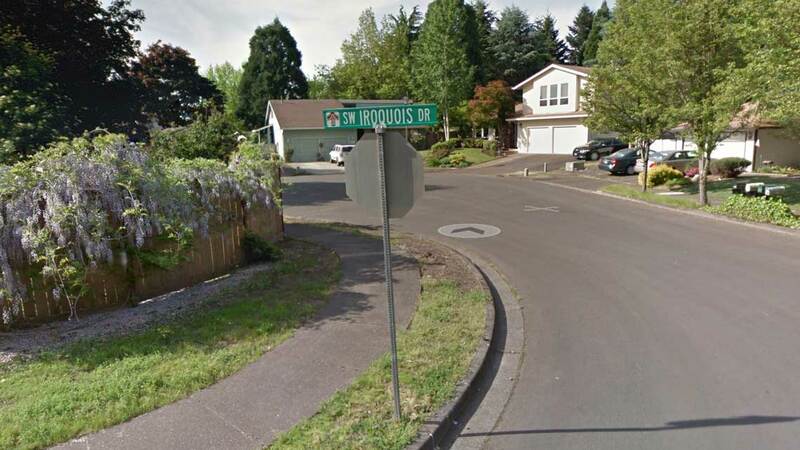 A street sign in Tualatin, Oregon. From Google Maps. People in the United States share a lot of stories about the country. The stories we tell are on television, on the Internet, in books. They are what we tell each other about our experiences. The nation also tells a story about itself. Every morning when I was in grade school, everyone stood to recite the Pledge of Allegiance. In various ways, I was compelled to celebrate the history of the country, to have faith that I, a Mexican girl from a trailer park, meant something to the Founding Fathers or the president. Learning to be “American” was an implicit lesson that I learned in school, but it’s not the only way to learn how to be a citizen. One of the places where these civics lessons exist and we are asked to accept them is in the streets. Street names, such as Washington Avenue or Kennedy Way, commemorate important, almost mythological individuals of history in the United States. Their names, etched onto the land, remind us of where we are and where we supposedly come from as a nation. But what happens when streets are named after a generalized group of people—people who have been and continue to be brutalized by the the government? What are some important terms to know when approaching the work that you do? There are a few, but I would start with space. The world out there is not just this empty stage upon which things can happen. I like to think of space more as a verb than a noun. It’s a process or production of meaning-making that you create while you’re engaging with the world. So there may be something out there, but depending on your perspective, you’re going to see it and understand it in different ways. I’d also add the term settler colonialism. This can be thought of as the kinds of engagements with space or the world that take place. It’s when people move into this area and displace or eliminate those indigenous people. Not only are resources taken but the land is taken as well. I define the next two terms as a pair. Indianness is a mythological idea of what non-Native folks think of as Indian. So it’s imagery. It’s the simplistic “plains” figure with the horse and the headdress. Indigeneity is actual indigenous cultures that are much more multiple and diverse, that are much more grounded in specific cultural identities and practices. Is “settler” opposite to “Indian” or “indigeneity”? I wouldn’t say opposite, but they definitely define one another. You can’t have an indigenous without a settler and vice-versa because they only make sense within their context. So if nobody’s coming and settling, then there’s no need to differentiate or designate the indigenous. And also these aren’t exactly binary because there are other categories. There are other people that come to the US that another scholar calls “arrivants.” For example, if you’re enslaved or you come as a migrant worker, you might be called an “arrivant.” Also, there are people who are mixed. So, you can’t really be a binary of yourself. How do settlers manipulate indigeneity? How do they create indianness? That’s kind of the origin of my book Native Space: Geographic Strategies to Unsettle Settler Colonialism. I wanted to ask a lot of questions. Why are there so many street names named after Native people? Why are they always in clusters? Why are they everywhere? And why are they usually inhabited by a primarily white demographic? So I thought a lot about that. In the town I grew up in there was a neighborhood called Indian Village. It was called that because each of the names of the streets was named after a tribe or some “indian-related” topic. “Tipi” was pretty common. So, I had grown up with that, but it wasn’t until graduate school that I saw this elsewhere. I realized that this phenomenon didn’t just happen back home, it happened in other places too. I realized these weren’t truly Native places because I was in and around, and raised and cared by and engaged with those communities back home. There were reservations nearby and other communities, and these Indian Villages weren’t that. This was just a street. When I tried to look at it at graduate school, I thought about San Diego and said, “well, where else does this take place?” It took me into this long research project where I found out, among other things, that this phenomenon happens everywhere and most frequently in places that are extraordinarily white; so if there was a county that was 94 percent white, this was a place that would be 98 percent white. I think the intent is thought to be positive, marking a sort of history of this land or the people that were here “before,” but I’ve always thought that was really short-sighted. It’s great to try to use those names to mark spaces, but it doesn’t really do much if there’s not more to it than that. Why doesn’t this do anything beneficial? Because really, it doesn’t say anything about Native space. It doesn’t have any relation to Native communities whatsoever. And nobody’s ever asked for those names to be placed there. So then the benefit is really just the appeal that these places are sort of rustic or natural to contrast with the rest of the area, which is usually suburban or residential. So, why do you think it’s so easy to ignore that—that there’s power in language? Why is it so easy to drive by these signs and ignore what they say? I would say there are probably two reasons for that. One, I think, is because it’s considered to be mundane or banal. You don’t think, “What work does a street sign really do?” on an everyday basis. So it seems pretty neutral or innocuous. It doesn’t seem like it really matters. The second reason is that indianness or the notion of Indian is also commonly available within dominant US culture. It’s a way of telling US history, to harken back and say “look at the first Americans,” as if they were already Americans or our mythical sort of ancestors. It’s a way of folding them into the citizenship, into the nation. I should also note that the names for places or things that I’m talking about are not the names that were carried over. So it’s not like there was a river called the Mississippi and settlers just adopted it, and now we still call it the Mississippi. No. Settlers intentionally named them these ways as part of a strategy to make Native people a group to be included within the nation. Because if they are included or incorporated, then they don’t need to be reconciled with. Then they don’t have to deal with the dispossession of land. Do you think that these naming strategies do a service or disservice to support the well-being of Native communities? Mostly I think that this does a disservice because it perpetuates this language that mythologizes or places Native existence in history, so that it becomes normal to think of indigenous people as part of the past. But I don’t think it has to be a disservice all the time. In my book, I look at the ways this street-naming practice sometimes serves to open up possibilities for relationship-building with Native communities. But you have to take it seriously and do work to engage with tribal communities in order to create these spaces that restructure power. Then again, I don’t think tribal communities are overly worried about this. I think this is just part of the everyday stuff that Native people have to deal with, whether you call it microaggressions or something else. This is the sort of thing that you just know or expect. Sometimes people see this as a thing to celebrate, like “oh, something that marks me!” And they feel empowered by that. I look at it and think, yes, that’s true that this can be seen as positive by some people. And at the same time, I think that it doesn’t help to build the knowledge or relationships that are useful, that would benefit both Native and non-Native people. Inching toward justice or righteousness is something that people should just want to know more about. You said that seeing imprecisely-named “Indian” streets is just one of the many things that Native folks have come to expect and deal with. What are some other ways that ideas of Indianness are projected? What are some other phenomena that claim to be attempts at multiculturalism, but which in reality just benefit the oppressors by making them seem inclusive? I think that some of the more common things that are pointed at are things like a headdress being used as fashion item. Or when people appropriate regalia for costumes. What does that do in terms of building or destroying relationship possibilities between different communities? What is it saying about respect or understanding of cultures and histories? This is a pretty common sight because you get it every year. You get it every Halloween, you get it every Thanksgiving, you get it every Coachella. You see it with mascots too. People wearing these dismembered heads around on their clothing. How do you celebrate an Indian where you don’t have any context? You have to think about what it means to have these abstract figures with no context. The “Indian” is just a racialized abstraction; it doesn’t have any particular meaning. Like, who are we talking about here? You can’t celebrate a whole racial group, can you? It makes you wonder, why are these images so important? Why are people so attached to them? Why is it so meaningful for them if they are not connected to those histories at all? To bring this out to a bigger picture, why are these things important for us to understand as non-Native folks? I think we should all be cognizant of when and how we wield various kinds of power we have. Inching toward justice or righteousness is something that people should just want to know more about. And since Native folks are such a comparatively small demographic, the impact is bigger when we try to move in this direction. Those are the burdens when you are in a position of power or influence. You have to think about how your power affects others. I know it’s not always bad intentions or explicitly racist actions. This is the culture that you swim in and you can’t help not get wet by it. So, start thinking about how you dry off a little bit. My last question to you is a little bit grandiose. What do you think is or can be the power of language? It’s the way we communicate meaning and value. It communicates how we see the world. How we connect and relate with other people. How we form our self identity and our cultural identity. It’s how we share our world with people and how people articulate their world with us. So, if we name a street after George Washington, we are honoring him but if we name a street after the Iroquois Indians we are dishonoring them? We had a war with Japan 70 years ago. If we now name a street Japan Street, are we dishonoring them? This article sounds like political drama, not any account on street names.